Ear-shattering cracking noise, bending metal squeaking, exploding airbags and broken glass flying around. The Germans did this torture four times in a row with two cars. One of them was properly repaired between the crashes, the other was a bodge job. Luckily, only dummies were killed. Accident free: those are magic words in any used car ad, and not without reason. Buyers love it. If only one panel has been resprayed, it's already considered as an extreme risk, because if something was crashed before, it's impossible to fix, the whole family will die. The Germans made a lot of effort to prove what kind of nonsense this is; moreover, how big a risk it really is to drive an unprofessionally repaired car. It can be a question of life or death, but I have to warn you right at the beginning, those things are not black and white, like an Alpine cow. 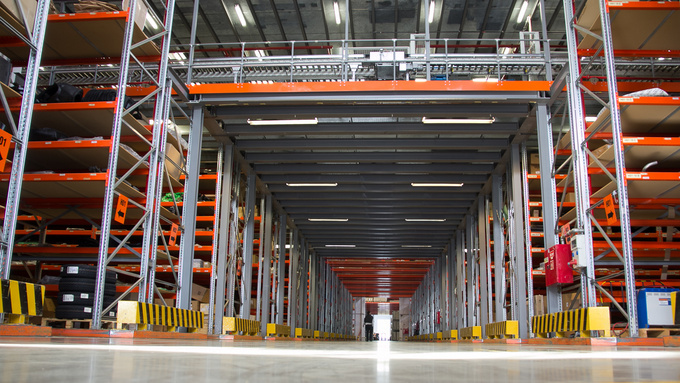 The Kraftfahrzeugtechnisches Institut (KTI) – which deals with many car-related matters – did finally, what we have been waiting for so long. They compared the crash results of a properly repaired car with those of a backyard job. They took two unharmed Passat B6-s, crashed both from the side with a deformable barrier coming in at 50 km/h, very much like in a standard NCAP test. Nothing new until now, but watch what happens next! The grey Passat got the prescribed treatment. Everything was repaired according to factory specs, every bent panel made out of high-tensile steel was replaced with original parts. If something had to be glued, it was glued, if something had to be welded, they welded it with proper machinery and proper settings, no matter what the cost. They had to replace floor panels, inner and outer sills, a complete B-pillar: in real life this should have been a write-off. Then they crashed it once again with the same method. 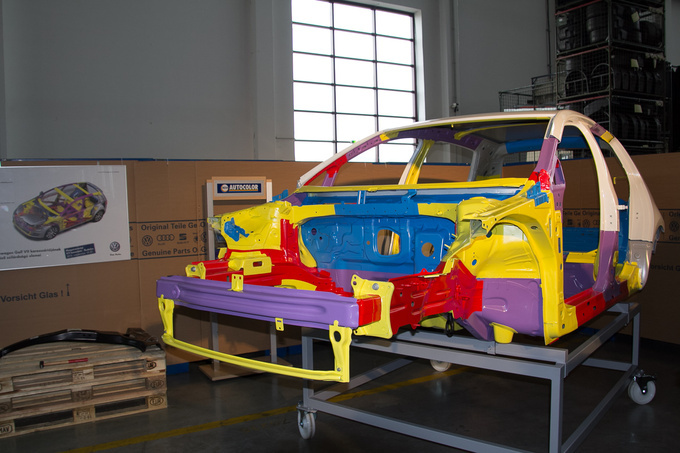 The deformation values measured at 17 points, were almost exactly the same as in the case of the undamaged car, so were the loads on the dummy - these became the reference values. 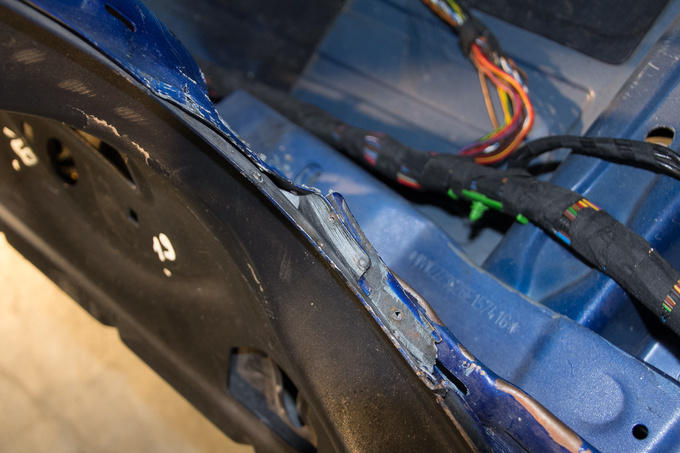 If we stop here for a moment, we already have one important conclusion: even a badly damaged car can be repaired in a way that matches the maker's safety specs. Don't ask how often this happens in reality. The blue Passat followed a more realistic path. It's probably not a bold assumption if I say that a badly crashed German/Italian/French car rolling on a trailer to the East will get a similar repair in a moderately hungry Eastern-Central European country like, say, Hungary. Or even a much worse one. Where it was possible, they pulled out the creases with a bit of heat: the slightly compressed cardan tunnel, the floorpans, the inner sill. They welded the cracked and torn parts and cut the B-pillar in the middle with a definite move. After that they welded in an amputated original part with an end-to-end joint with a MIG machine. We could just say that this cut-out part came from a wrecked car imported from Britain. Apart from the seam on the B-pillar they spot-welded the panel to the inner sill with the usual settings from the old days. The KTI guys say, they repaired the B6 Passat like the two generations older B4 where all of this was allowed. They added that it was a specific requirement not to do a bad job, just carry out the job as they would have done it ten years earlier. So they replaced the airbags, connected them, cleared the error messages and even properly adjusted the doors before spraying everything in a shiny blue colour. At first sight it was impossible to tell that it was an unprofessional repair. To be precise, there is no known simple method to find that out. The second crash brought a dramatic result: according to the measured values the passenger dummy died because of a bad hit on his head, although he had survived the first crash. Right now we feel that we'd never ever buy a previously crashed car, and those who do are potential killers of their own family. But I had the chance to see the two cars in the flesh and to talk to the KTI experts to get a more detailed picture at a press event organised by the Hungarian VW importer. The Passat B6 comprises an incredible amount of high-tensile steel. The inner sill and the seat console is made of steel with 300-420 N/mm² tensile strength, the cardan tunnel, the B-pillar and the roof structure of sheet metal stronger than 1000 N/mm², which is quite a high value. Plus, those panels are not very thin; there are parts with 1.5-2 mm thickness. This is heavy machinery, not the old Volvos. 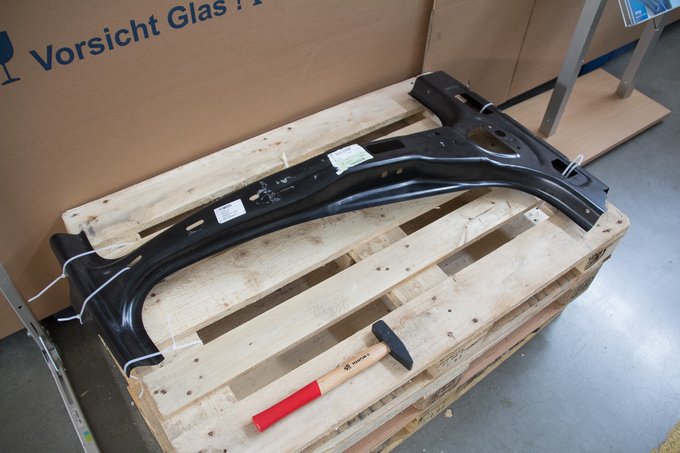 In order to show how strong those parts are, they presented a B-pillar fixed to a pallet that we could hit with a medium-size hammer. It didn't even bend. Okay, I have some friends who possess a hammer of adequate weight to destroy it, but it was good proof of the fact that modern cars have parts that are several times stronger than those of older ones. 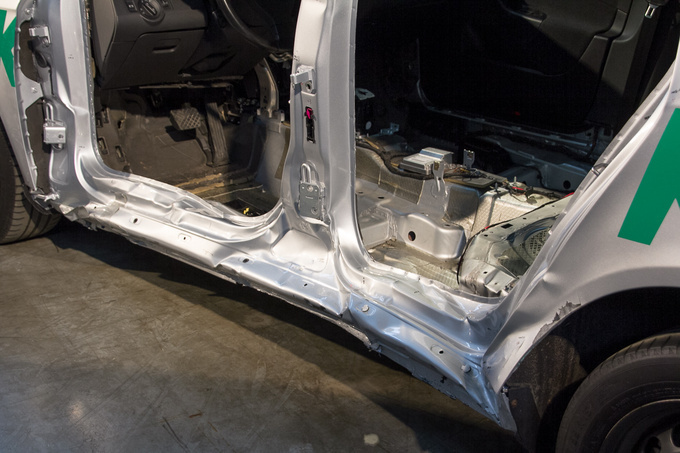 If we only take tensile strength, there is a factor of 6 to 8 compared to standard body panels, although one should be aware that there are other important factors when having an accident. I only waded into material science because it is exactly this special kind of steel that made the blue Passat performing worse after the repair. It just doesn't like beating out dents and getting excessive heat which is a standard procedure when doing body repairs. The panels have to be welded in a professional way and since they are usually quite thick, this process should be done with a huge current and proper clamping force. What kind of welding machine do you get for the price of a new car? 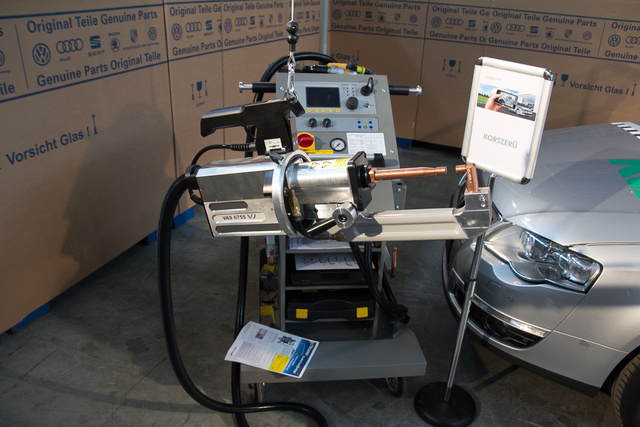 At the press event we were also able to take a look at a state-of-the-art welding machine which is capable of doing professional repairs on modern cars. This one was so new that even the authorised VW-dealers don't have it around here, but of course they do have one that's up to the job. The VAS 6755 costs about 15,000 Euros plus VAT and has the approval of several car manufacturers, not only VW. The maximum power output of this machine is 75 kVA, which is around 100 horsepower if you'll excuse this kind of homegrown conversion. 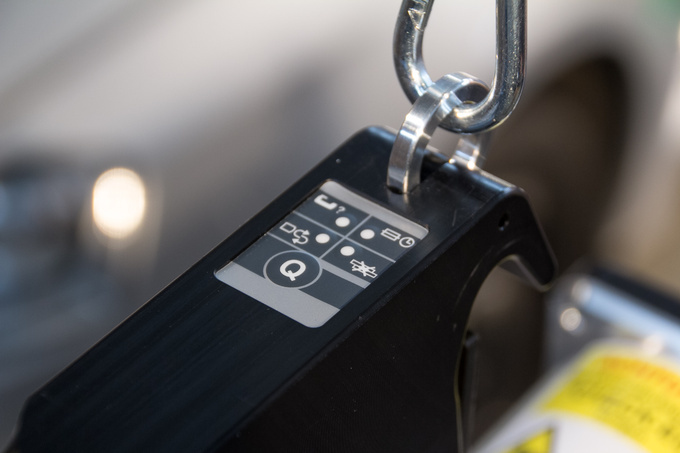 It delivers 12 kA, in bigger numbers 12,000 amperes of welding current and is capable of 5 kN clamping force which is half a ton - all of this packed into a neatly balanced machine head which can be operated with one hand. The most beautiful feature, however, is the foolproof one-button principle: with one push of your thumb it'll measure the thickness and the material properties of the parts, calculate the appropriate force and welding current and finally do the spot-welding in one move. There's virtually no chance of making a mistake. Of course, it's not absolutely necessary to have such a high-end machine for every repair done on a car with high-tensile steel, but according to the specialists you'll need about 10,000 amperes for multi-layer weldings. Professional disassembly is also an important job, that's why the drill-out kit is also part of a professional workshop. In order not to harm the undamaged body parts during the disassembly process you can use a pneumatic drill with double seating, adjustable to one tenth of a millimetre. Of course, the drill is capable of machining high-tensile steel. If you take a closer look at the Passats you can discover some serious differences. 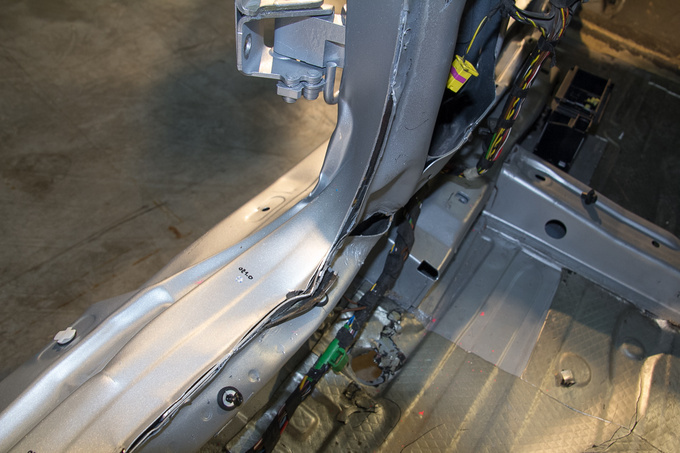 The lower part of the B-pillar has been pushed in much further on the unprofessionally repaired blue Passat - KTI says in some places by as far as 6-7 centimetres. 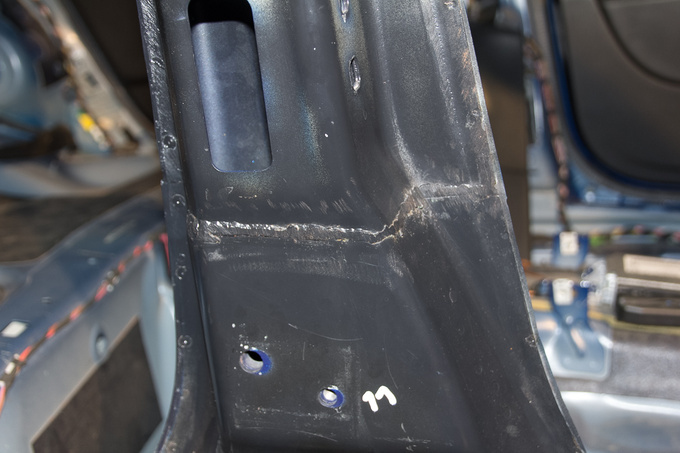 The bottom of the new welded-in B-pillar became deformed in a very different way from the first case – : you can see that the structure behind it was weakened. 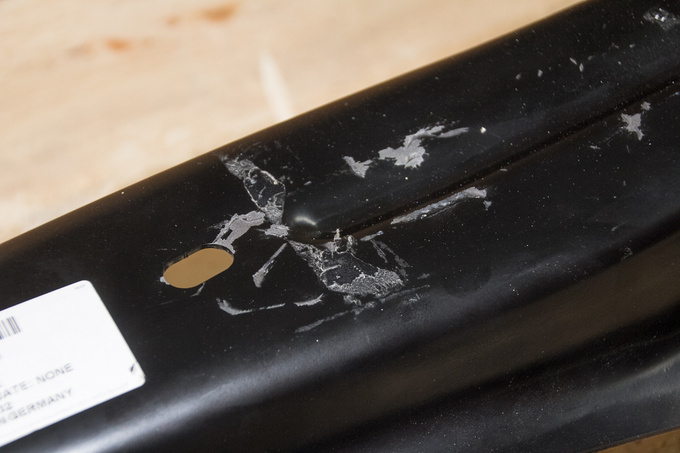 The spot-weldings of the inner and outer sills were torn apart, and on the inside you could see a much bigger crack on the inner part of the pillar: this was the place where they did some hammering and welding after the first crash. The seat of the blue Passat was so badly damaged that according to the measured values the pelvis of the passenger would have been crushed. 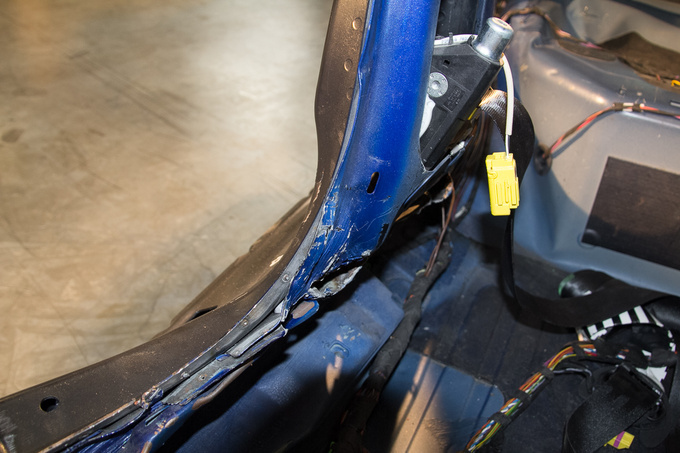 The side airbag inflating from the seat cushion was trapped between the pillar - that was pushed in further than originally designed - and the back of the seat, so it couldn't help the occupant. But the reason for the deadly head injury was undeniably the fact that the curtain airbag didn't open. Why not? It's a mystery that I couldn't solve. 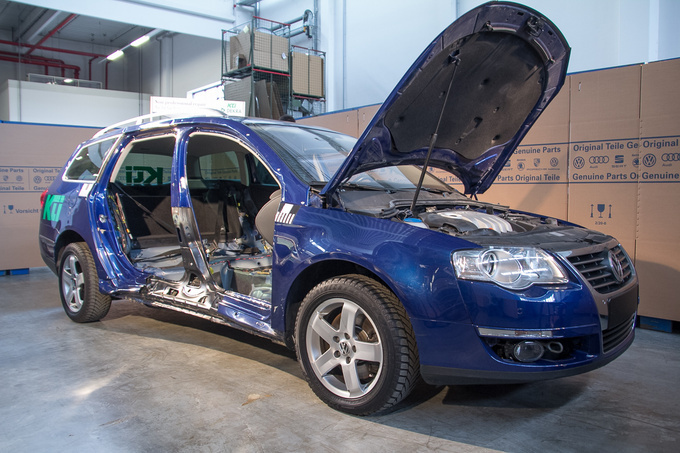 The specialist from KTI informed me about two possibilities: the wire of the curtain airbag could have been disconnected because the body structure was more deformed than expected, but this is not very likely, he admitted. If I were a specialist at KTI, I'd have checked that since a broken wire is relatively easy to spot and that way they could have eliminated at least one possibility. On the other hand, it would be sad if VW only calibrated the wiring for just a certain, assumed crash intensity – what if someone hits your car at a higher speed than what they have at the NCAP test? No airbag protection then? 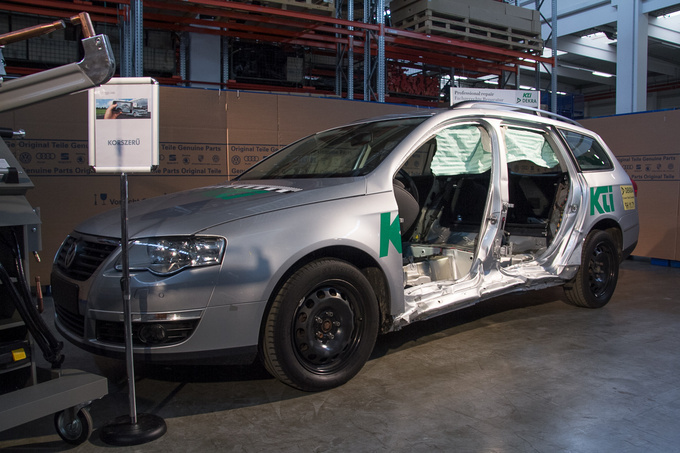 The other, more likely possibility according to KTI is that the acceleration sensor didn't trigger the airbag, because the deformation caused by the crash was softer than expected by the designers assuming an intact body. That way the peak value needed for opening the airbag wasn't reached. Too bad they didn't measure that, because in reality curtain airbags usually open in even less serious crashes, and the passenger died undeniably because of the non-functional airbag. Looking at the bent panels, it's surprising that the weird-looking, unprofessional welding seam at the middle of the pillar didn't break at all. The sill which was cut and welded contradicting the factory specs, didn't crack either. It was the structure behind the replaced parts - which was heated, beaten and welded - that lost its strength in the procedure. The result of the engineering is fatal, anyway: this is a strong reminder of how much responsibility the repair workshops have. You'll have to draw your own conclusions. One thing is for sure: it's not a good idea to crash a car twice in the same fashion if it wasn't impeccably repaired in between. 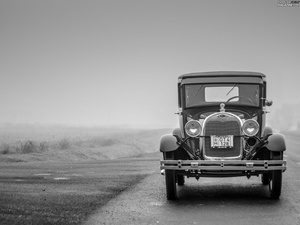 Another point is that high-tensile steel is not just a buzzword in the ads anymore; it's there in the five or ten year old ride at the used car dealership too, and that demands a lot more expertise and tools from the panel-beaters than the old-school technologies. A crash that doesn't look too bad at first glance may result in a write-off if you want to replace everything according to factory specs. This is one reason for buying damaged cars from Western Europe and transporting them to the wild East and here's the explanation why even here, in Hungary dealers are buying cars that are not worth repairing properly. In theory the factory manuals are available to everyone, but it's not typical that backyard workshops would take advantage of this – partly, because following them wouldn't result in financial success. And a final point for the prospective used car buyer: it's a sad fact that it's nearly impossible to spot if a previously crashed car has been repaired professionally or not. If you see some suspicious signs, there is usually some problem. The solution for this unfortunate situation could be an easily accessible, public database (like Carfax in the US for example) where you could look up every major damage of used cars, ideally with pictures and repair documentation. Insurance companies keep similar records, but they only show this kind of data to each other. I'm sure it would be a popular move for the EU to introduce something like that in Europe. Until then we can only applaud VW's decision that they'll set up their own internal database where they'll keep track of every body repair done at their authorised workshops and make it available to the owners soon.